Our joyful Shoreline cheer squad celebrates winning the prep football metro title in Memorial Stadium. Ah yes. Reading Bill Kossen’s story, “Turkey Times – 50 years of tasty Turkey Day Game memories and my love of prep football” printed in the Seattle Times Nov. 22, 2012 brought back many happy memories. Kossen said he went to his first high school football game 50 years ago at age 7, and every year since has made an annual pilgrimage to Seattle’s Memorial Stadium (in the shadow of the Space Needle) to catch a game. That game 50 years ago hooked him into the world of prep football, and now as an editor and writer for The Seattle Times, he shared some of his fond memories. I, too, have fond memories of Memorial Stadium and prep football. My father was a football referee, and oftentimes my sister and I would go to his games. We loved the energy of the crowd, the excitement, the band, the colors, the lights, and mostly, the cheerleaders. We were young – pretty sure I was in elementary school and she was in middle school, yet we had a great time evaluating the cheer squads’ choreography (and picking up some new moves). We chose who we thought was the prettiest, who had the most pizazz, and who had the coolest uniforms. At age 23 I became the choreographer for the Seattle Seahawks Sea Gals, and I’ve judged Sea Gals tryouts for over 20 years. I guess it shouldn’t be a surprise that those exciting nights in Memorial Stadium would lead to decades of dance, cheer, coaching and choreography, but I never thought it was a talent. I always thought everyone could do it. To this day, I love watching football. And I love watching the cheerleaders. I try not to be judgmental in everyday life. And I certainly keep life in perspective and realize that cheerleading, dance, twirling and football are all just hobbies. But I am thankful for them because they provide a brief escape from my daily routine. They’ve brought joy, fun, friends, excitement, and hundreds of cherished memories into my life. As far as this weekend goes, I’m looking forward to tomorrow’s Seahawks game. Yesterday’s Apple Cup matchup between WSU and the UW was one of the closest ever. And as for my high school alma mater, I can no longer cheer for it. 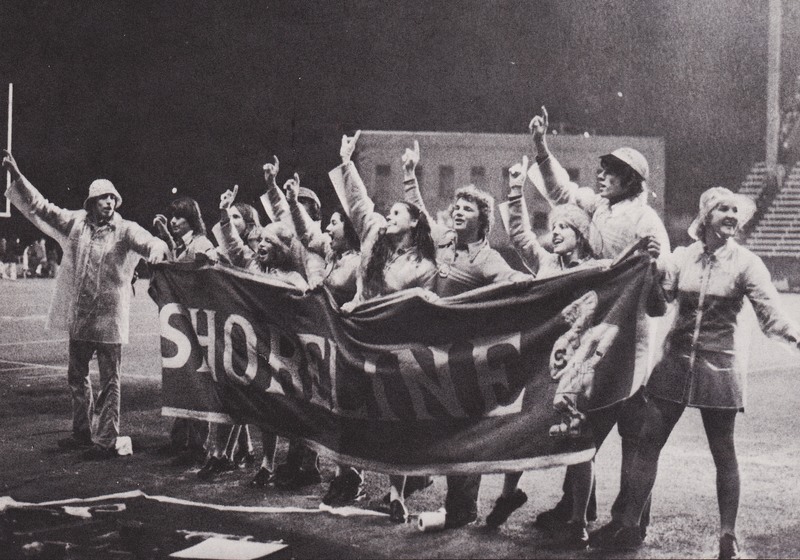 The Shoreline Spartans, who reigned supreme in the Turkey Day battle when I was one of their cheerleaders, are no more. The school is now the community’s senior center. Ouch! This entry was posted in Cheer/Dance/Performing and tagged Bill Kossen, Cheerleading, Memorial Stadium, Prep Football, Sea Gals, Shoreline, shoreline high school, Twirling by Sheri Leonard. Bookmark the permalink.